Fossil records indicate that nautiloids have not evolved much during the last 500 million years. Many were initially straight-shelled, as in the extinct genus Lituites. They developed in the Late Cambrian period and became a significant group of sea predators during the Ordovician period. Certain species reached over 2.5 m (8 ft) in size. The other cephalopod subclass, Coleoidea, diverged from the nautiloids long ago and the nautilus has remained relatively unchanged since. Nautiloids were much more extensive and varied 200 million years ago. 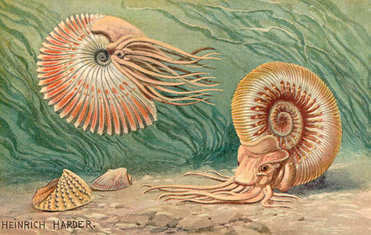 Extinct relatives of the nautilus include ammonites, such as the baculites and goniatites. They are still found in warmer climates today, But are endangered. A Grade specimens have had hours of work on them to get them highly polished and showing those distinctive gas chambers of beautiful brown tones of calcites. They are more expensive than standard quality but are highly collectable and perfect to display. Some are large, some are small, but all are beautiful.